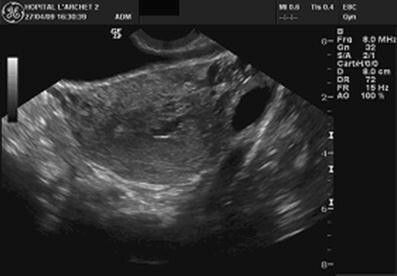 A 26-year-old patient presented at the emergency department because of uterine bleeding for the previous 3 days. She had undergone voluntary termination of pregnancy by curettage 2 months before. Upon clinical examination, metrorrhagia was moderate, with heart rate: 90/min, blood pressure: 110/80 mmHg and temperature: 36.9°C. 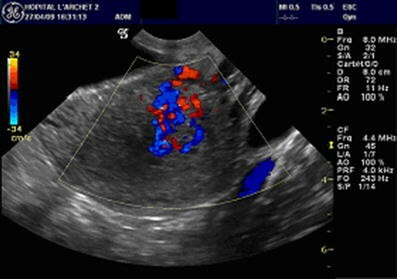 Intra-vaginal ultrasound examination showed a heterogeneous intra-uterine 30 × 20 mm image suggesting the presence of ovulatory debris following curettage, but the significant vascular supply of this mass upon colour Doppler imaging, revealing a high velocity vascular network, was in favour of an uterine arterio-venous malformation (AVM) [1, 2]. The diagnosis was confirmed upon arterial computed tomography showing the UAVM was located in the portion joining the uterine body and fundus and mainly supplied by the left uterine artery. 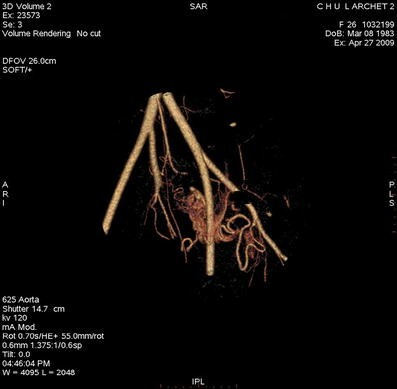 Treatment consisted in selective embolization of the UAVM [3, 4]. There were no complications or any further bleeding (Figs. 1, 2 and 3). Metrorrhagia is a frequent motive of presentation at the emergency department and often leads to curettage as uterine retention is the common diagnosis. Performing colour Doppler imaging in such a context may reveal the presence of an AVUM, a situation in which curettage could lead to massive and potentially fatal haemorrhage through direct vascular trauma .